CityEconomist Update: MONEY | "Annuity-Peddling Scoundrels"
Yesterday I posted something on "Annuities: Caveat Emptor". This morning, January 19, on the first page of The New York Times Business Section, I read Ron Lieber ("Your Money") on "Finding Advice for More Modest Retirement Investments". He makes a significant off-hand reference to "annuity-peddling scoundrels". So I am re-posting some of what I said yesterday, expanded (and modified) in light of Lieber's comment and some data that he references. 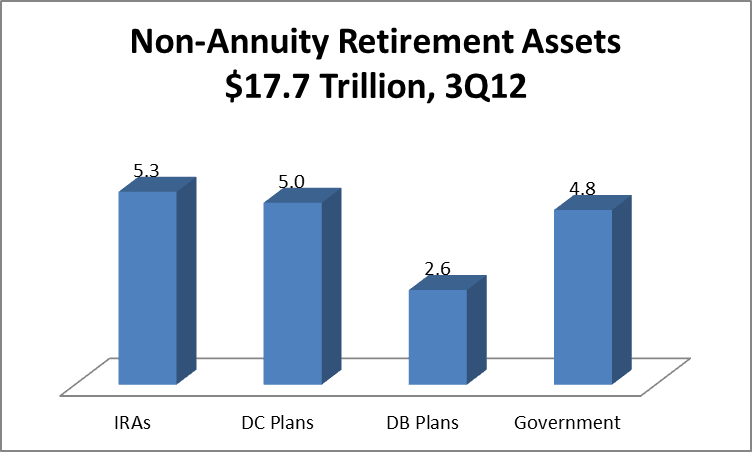 The chart above shows tax-advantaged non-annuity retirement assets, as of the third quarter of 2012. The Direct Benefit and Government plans are mostly safe from predatory annuitization because they are already paid out in that form and it is often not easy to take out the money in a lump sum. But I worry that some people who own a piece of the $5.3 trillion of IRA assets or $5.0 trillion of Direct Contribution plans (401k, 403b, 457 etc.) might be persuaded to convert their assets to an annuity. Pension industry posts suggest that annuities are seen by some as a new gold mine for people in the insurance industry. One writer suggests that annuities are a great opportunity to expand one's income. The writer is referring to the income of sellers of insurance products. In principle, economists like annuities because in theory they best match the need for people to have income until they die with a product that does it. Even President Obama is quoted as favoring annuities in a retirement strategy. So yes, in some situations an annuity might make sense: (1) Liquid assets that are not tax-protected. (2) Severance payments. An annuity might be a good way to make sure the money lasts as long as you do. - Their risks go up because they are giving up control of their money. If there is a sudden need for capital, all they are getting is the regular return. This is a huge loss of access. This is inherently desirable only when the annuity is being sold to someone who cannot make financial decisions rationally and for whom the capital is tempting to spend. - Insurance companies love annuities because they get to invest the money - so they pay their agents well to sell them. I have heard as much as 12 percent of the purchase price can go to the agent. Someone is going to pay for this, namely buyers in the returns they get. So if what you have is a 401k or an IRA, it is crazy to roll them over into an annuity. Far better to maintain control of them and when you get to be 70.5 years old, take the Minimum Required Distribution every year. For no fee, just the cost of the transaction, with no 12% load, the mutual fund or broker will figure out the MRD and pay it out like an annuity. Yet you still have control of the underlying assets and in an emergency you have access to them. You also don't pay taxes on the income until you take it out. Maybe I am just imagining a problem that doesn't exist. Maybe none of the 8.7 percent of retirement assets that are in annuities were rolled over from tax-advantaged retirement assets. But given the temptation and what we saw happen in the mortgage industry, I fear the worst and would love to see data that would either confirm or contradict my concern. The Investment Company Institute does not show on p. 122 of its 2012 Fact Book.the value of IRA accounts that were totally withdrawn. I would like to know that number. In my view, agents who sell an annuity to someone to be paid for by selling a tax-advantaged retirement asset should have their license taken away.